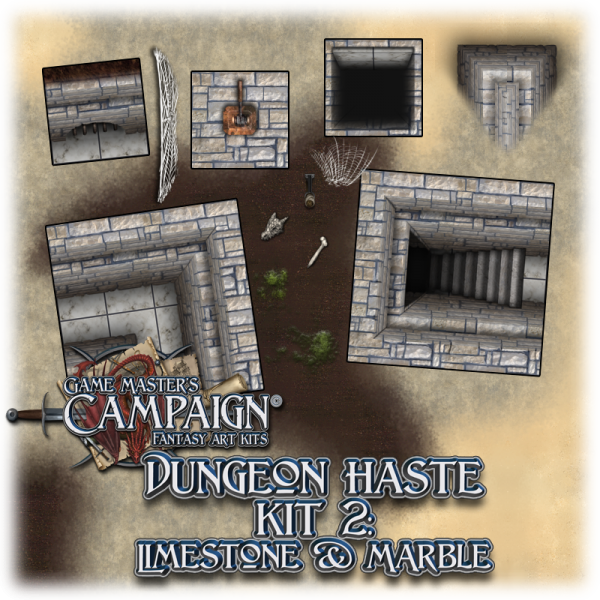 This is an art kit which both allows you to throw together dungeon maps pretty fast, using the Quick-tiles tiles which have floors, wall and objects merged into one file; and it allows you to created detailed maps using the separate files with or without the Quick-tiles. There is also a folder with Flex-tiles, allowing you to create corridors and rooms in almost any angle and shape you desire. Halfsize and Quartersize means these tiles are in scale with the images in the same scale found in the other art kits. This art kit does not contain Fullsize images, this art kit does not contain any character/creature/monster tokens. The artwork in this kit is new, does not contain artwork found in any of the other art kits. This purchase is for a digital download of several images, approximate size is 204 Mb in a zipped file. The halfsize tileset is typically 256 x 256 pixels, the quartersize is typically 128 x 128 pixels, although a number of variations in tile sizes are found inside this art kit.